Showing results for tags 'copenhagen'. 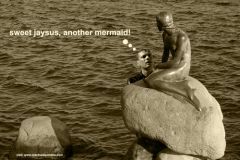 Yet again Larry found himself wet in the water with a mermaid, a lot of rock but not much roll!! © images from google photoshopped by the mermaid!